The Martian Chronicles is an amazing collection of interconnected stories about Mars. Human missions to Mars, religious missions to Mars, nervous breakdowns on Mars, etc... Even though some of the tales are outdated by today's views, the underlying values and messages remain the same; they are timeless. Some of the stories have been released previously, and some have been changed over the years. I discovered, thanks to Wiki, that one tale having to do with race relations, was not included in this collection at all. I'm not sure it really matters, but just know that this anthology is NOT the same as it was upon its original release. 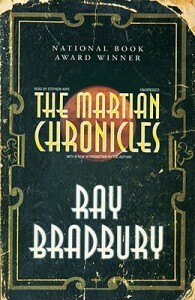 There's not much new I can add to what's already been said about The Martian Chronicles. Ray Bradbury's writing is so simple, yet so evocative-he can get across in just a few words what it takes me paragraphs to say. His observations on human nature are spot on and even though these stories were written back in the 40's and 50's, most of them are still relevant today. Classics are classics for a reason and this one is truly special. My highest recommendation!